Dr. Carl R. Thornfeldt is the CEO and Founder of Episciences, Inc. 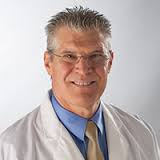 He is a practicing dermatologist with over 25 years of skin research experience, 22 U.S. patents granted and over 20 scientific publications in the area of treatment of skin diseases and conditions, including chapters in five dermatological textbooks. Along with these accomplishments, he has also spent nearly two decades focusing on researching the skin barrier and cutaneous inflammatory conditions.“I know there are many compelling theories about skin. Through years of research and treating my patients, I found by repairing the barrier and blocking chronic inflammation had the most profound effect on aging and skin health in my patients. I have spent a lifetime on proving the safety and efficacy of our product. The Epionce System starts with your skin type first, then customise to produce a specific aesthetic result, or help diminish a specific skin condition. Epionce Cleanse & Prepare products remove skin impurities without disrupting the intercellular lipids and cells that form the natural protective barrier. The cleanse and prepare process is important because it removes makeup, dirt and oil in readiness for the application of leave-on Lytic and Renewal products. Epionce Correct & Boost products are proven through rigorous independent testing to reduce the appearance of fine lines, wrinkles and unwanted pigmentation. The powerful Epionce ingredients have been formulated to avoid unwanted disruption or irritation to the skin. Your skin will look smoother, with a fresher more even looking complexion. Epionce Renew & Fortify If you are new to the range and wondering which product to start with we recommend one of the Renewals or Intensive Nourishing Cream. They are the cornerstone to good skincare and once you see the improvements in your skin you will start to appreciate why Epionce has become such a popular skincare line. Formulated with a wide synergistic array of proven active botanical ingredients. Epionce in-clinic skin peels and professional size products are designed for use by skin care professionals who want to provide safe but very effective treatments. The Epionce peels are medically supervised chemical peels available for in-clinic treatment procedures. Each peel system helps improve the appearance of problem and photo-aged skin by deeply cleansing pores and removing skin scale while smoothing the skin to help reduce the appearance of fine lines, wrinkles and hyperpigmentation. Talk to your aesthetician to understand which peel is suitable for you. 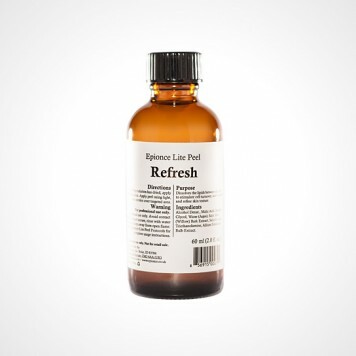 Formulated to improve the appearance and texture of the skin by increasing cell turnover, the one-step esthetician-strength Lite Peel: Refresh is the perfect “lunch-time” skin freshening treatment. It relieves skin congestion, dullness, sallowness and improves acne with no downtime. The Lite Peel: Refresh has a pH of 2.9. 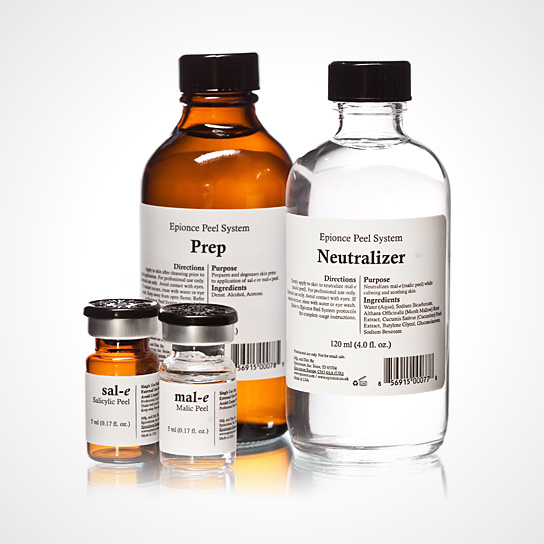 Formulated to improve the appearance and texture of the skin by increasing cell turnover, the physician-strength Epionce Peel System provides the same corrective benefits as a Jessner’s with minimal downtime. There are two parts: sal-e and mal-e. The steps can be used as standalone treatments or together for medical/clinical settings where the medical professional can customize the treatment series to the needs of the patient. The Epionce Peel System improves skin aging, hyperpigmentation, acne and rosacea. Prep – Thoroughly cleanses, degreases and sterilizes the skin’s surface before applying the peel. Neutraliser – Neutralises mal-e peel while calming and soothing skin. For additional information or to order Epionce Professional Series products and training requirements, please contact us.